Here’s a comment that I received in response to my Wine Spectator blog, which came from the Open Wine Consortium Website. It was asked by Ron McFarland of New Zealand Foods, and is a look with predictions into the future of advertising. Time will tell if any of this makes sense or not. You are pretty dialed in and a great thinker. What we do not [know] is … are we just in a hiccup phase or descending into a new valley with a totally different landscape and a new sense of purpose? Maybe traditional advertising will be meaningful and have the expected impact or maybe not. When I’m asked a question, it really brings out the thoughts that I’ve yet to articulate, but have been swirling around in my head. They’re not yet totally shaped, but when asked about something that I’ve been pondering, I find some answers as I get more involved in the process. Sixteen years in one business gives a person insights, only because of the myriad of experiences, including lots of growing pains along the way, glass ceilings et al. That’s the “dialed in” part. We’re in much more than a hiccup phase. We’re in what I’ve come to realize is an electronic communications revolution. And, because we’re in the eye of the storm we don’t even see the complete turmoil that we’re in; however, we have a few glimpses. When the dust settles, we’ll be in a completely new valley, as you suggest. One thing we must remember is that the wheels of progress do turn very slowly, regardless of how swiftly this cyclone is spinning. 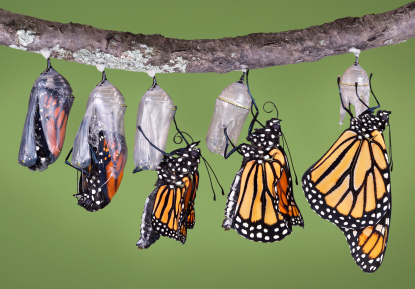 Although it’s accelerated by the Internet, it’s still remains a metamorphosis process, and you just can’t coax a butterfly out of its pupa until it’s darn good and ready. I can’t pull myself away from books, yet, however. There’s something magical about curling up with a good book and just absorbing while holding it. Books, too, are now becoming available on the Internet, and will eventually be collectors items, simply because they aren’t physical anymore. Traditional advertising will be segueing to the Internet in a more valued way, which means that advertisers will be willing to pay more, as the print options disappear. We see it now most broadly being used where it’s always existed… any media source. On-line newspapers… check that… new name… not newsPAPERS, but newsDAILIES. Magazines, like I’ve just mentioned with WS. I see wine bloggers as the next generation of wine writers to emerge, and while they may not make money for their blogging, the new newsDAILIES that emerge will be willing to compensate them for their stories… eventually… perhaps pay a fee for aggregating? But, will that pay the rent? Not at first. Good article and great response. Streamlining the news from traditional corporate run (bottom-lining, profit centers) news outlets to online authors doing it because they love it and who will eventually see revenue, is the future. This is clear. So should we see an explosion of on-line wine writers looking for their audiance? How big of an audiance do they need to be considered legit? Will these paper-based corporations really try and sink their teeth into this new medium? Will they try and apply their “maximize sharholder profits” concept to the online world? Will they crash and burn and fall to the wayside? Perhaps appropriate questions. One thing is for sure… D. T. C. is the future. yeaa! You’ve asked a lot of really good questions, and only time will bear the answers, of course. That said, one can always theorize what the future will hold. I honestly think on-line wine writers have already arrived, in varying degrees of expertise. I’m fascinated looking at the back end of my blog to see how many people find what I’m writing worth reading, but I don’t personally write to build an audience. I write because I’ve always been a writer… Some of us are born that way, just as some are born to perform surgery. I have stories inside that I just need to get out of me. Might sound strange, because it is, even to me. Anyone gaga over a new job s/he’s just been given as a writer, so should also be planning the reinvent, because it’s inevitable. Papers will HAVE to sink their teeth into this new medium, or die. It’s do or die, that’s all. It’s an evolutionary process, and perhaps a bit of corporate karma for how many board rooms have handled their raw talent in the past. Some will crash and burn, some will evolve. Some with hearts, some without. One thing’s for sure, we’re in completely fascinating times. Don’t run too far with the idea that online media is greener than print. It may, but not as much as people used to think. At the beginning of the year a story did the rounds saying two Google searches generate about as much CO2 as boiling a kettle. See (http://technology.timesonline.co.uk/tol/news/tech_and_web/article5489134.ece). Overall the global IT industry creates as much as the world’s airlines. Also computers and mobile phones etc impose a high cost on the earth’s resources. Second, the trees grown and mashed for paper tend to be sustainable. Sure the costs of manufacturing, printing and distributing ARE higher than delivering electrons to a screen, but the gap isn’t the yawning chasm we are often lead to believe exists.